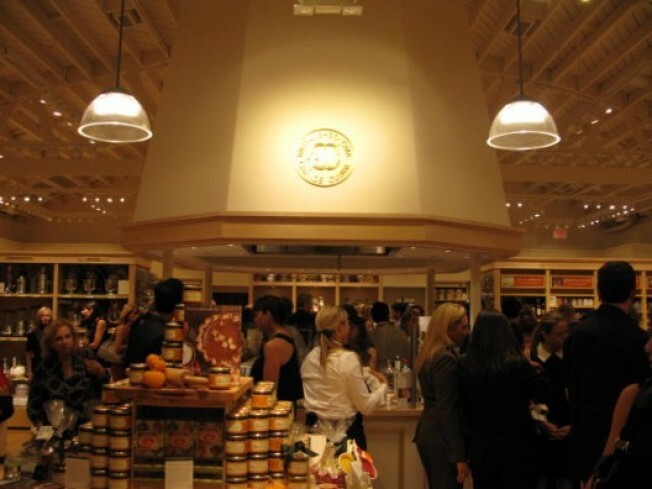 Williams-Sonoma celebrated the opening of its expansive new shop at 1600 Montana Avenue in Santa Monica last night to an enthusiastic crowd. Some combination of the ample catering from Bread & Butter (which pulled off a seamless array of small bites and desserty items, despite a kaput generator), the coconut-infused fondue by Dana Slatkin of Shutters on the Beach, and the opportunity to peruse three different sizes of ice cream scoops in a white-washed wood-beamed space, made for an overall festive mood. A combination of W-S customers, supporters of Children's Action Network (which co-hosted the event), local business and boutique owners, and foodie folks showed for the event, along with Santa Monica city council candidates using the opportunity to campaign. Lindsay Mock, who works in W-S PR reported that the early response to the store has been impressive: "We thought people would trickle in, but people really came out the first day, and our first technique classes are immediately filling up."